We've scanned the skies and found you the latest Cathay Pacific flight deals and promotions to popular destinations this 2019. The lively and densely-populated city of Hong Kong will surprise you with its diverse culture, varying tourist attractions and endless shopping options. As the city with the most number of skyscrapers in the world, Hong Kong fascinates travellers with its impressive view. Its versatility can be seen in its breathtaking harbour and islands, urban hiking trails and world-class theme park, attracting many kinds of travellers. A key route for Cathay Pacific, prices for Hong Kong flights are at their cheapest during February, where the average price is $195 as of January. Ticket prices peak in June and December. Bangkok’s street scene will leave urban explorers in awe, offering you the best experience from dawn to dusk. As a metropolis, the unrivalled choice of street food makes it the best place to taste authentic Thai cuisine from various parts of Thailand. The enigmatic temples, skyscrapers, and ancient ruins add to the charm of Bangkok, a city that never sleeps. Bangkok is another major route for Cathay Pacific and other major airline carriers in Singapore. On average, Bangkok flight deals are cheapest during July where average prices drop to $131. The metropolis of 10 million people finds a dynamic way to be futuristic and green with its urban parks and signature river amidst towering skyscrapers and glass buildings. The sheer number of historical palaces, folk villages, heritage sites, and museums makes Seoul an architectural marvel, while the sprawling local markets are evidence of zealously preserved culture. The symphony of tradition and modernity in Seoul inspires and charms travellers. Prices for Seoul flights peak in January to February and the cheapest month to find deals is June, where the average price from Singapore is $380 as of January. The spectacular little city of Taiwan begs to be explored time and time again. Beaches, lakes and national parks conjure up its natural charms while towering skyscrapers and monumental buildings give the city a contemporary touch. The fusion between Chinese, Japanese and Western cultures not only results in its eclectic cuisine, but also furthers its role as a living museum. Prices for Taipei flights are cheapest in August where the average deal is $181 as of January. The financial capital of China is bold and indulging, evident in its trendy restaurants and its world’s longest shopping district. Amidst the inevitable skyscrapers, the architectural heritage in Shanghai still dot parts of the city, with its traditional laneways, stone-gate houses, cathedrals and synagogues. Its vibrant arts scene goes in full swing and there’s no better time than now to visit Shanghai. Prices for Singapore to Shanghai flights hit their peak in July and December. The cheapest month to book a flight deal is February, where the average price is $275 as of January. Dubbed as the nation’s kitchen, Osaka invites foodies from all over the world to experience its top-notch gastronomy scene, evident in its local markets and restaurants. As the second largest city in Japan, the up-and-coming tourist hub offers many attractions such as world-class entertainment park, well-preserved castles and contemporary art galleries. A well-rounded destination, Osaka entices travellers from all backgrounds. Peaking in December and January, Prices for Osaka flights From Singapore are at their cheapest in February, where the average price is $131 as of January. The ever-evolving New York City continues to be vibrant for as long as you can remember. Classic and cutting-edge art galleries and museums makes the city a significant cultural center, while its cosmopolitan background bears witness to the steady rise of exceptional global cuisine. The big city bustle and architectural treasures contrast nicely with its renowned park and tranquil botanic garden, making New York City simply an irresistible destination. Prices for New York flights peak in August and December and the cheapest month for finding good flight deals is March, where the average price is $692 as of January. The financial city of San Francisco tends to be eccentric, from its buildings, museums, shops to street arts. Its hilly and mountainous surroundings offer splendid panoramas against the cityscapes, while its islands carry distinctive characteristics ranging from tide pools, Victorian houses, Hawaiian tiki bars to animal sanctuary. The spirit of social revolution in the diverse community of SF will make any travellers feel welcomed here. Prices for San Francisco flights are cheapest during February, where the average price is $560 as of January. Beijing, the capital of one of the biggest countries in the world, attract visitors with its ancient historical attractions, hidden lush greenery, and delectable Chinese cuisine. Home to a total of 7 UNESCO World Heritage Sites, Beijing hosts various attractions for all kinds of travellers. Ancient alleyways, glittering night lights and stunning buildings will make any urban wanderers gape in awe. Prices for Beijing flights peak in August and January and the cheapest month is March, where the average price is $277 as of January. Although considered the leader for futuristic innovation, it doesn’t take long to see that Tokyo still uphold its arts, culture, and traditions. Unspoiled old towns, bright red shrines, avant-garde museums and sumo training houses proudly stand tall amidst swanky bars and ubiquitous subways. Cherry blossom viewing continues to be practiced and excellent food can be found almost at every corner. When all is said and done, sit back and people-watch until the night ends. Prices for Tokyo flights peak in December and the cheapest months are from Mar to November, where the average price is $402 as of January. 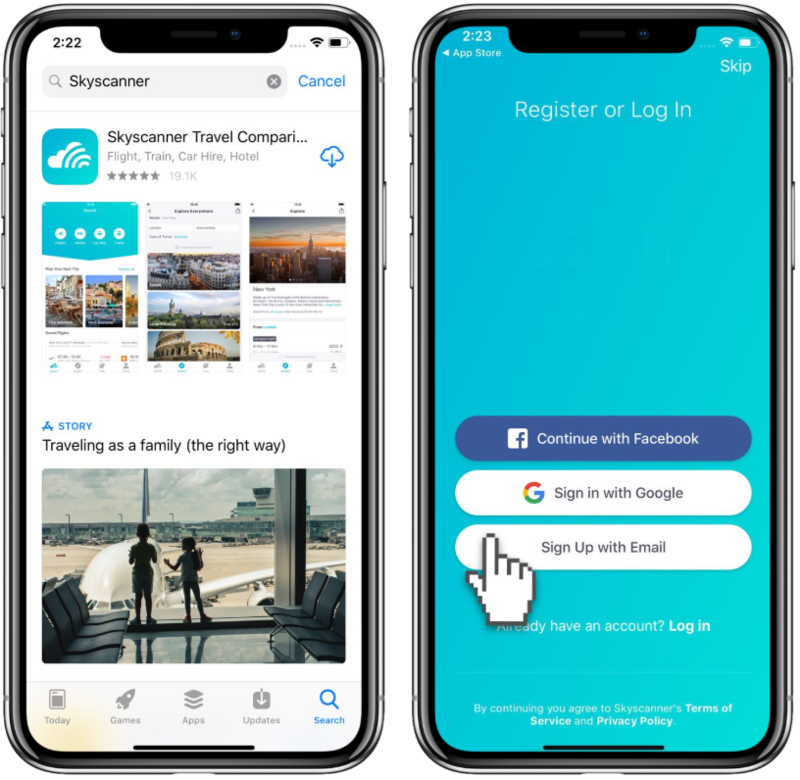 To find the best Cathay Pacific promos, start off by downloading the Skyscanner app on iOS and Android. You can easily login with your existing social identities. This way, you can create custom price alerts and get notified when ticket prices drop. Don’t have an account? Setup is safe, quick and hassle-free. 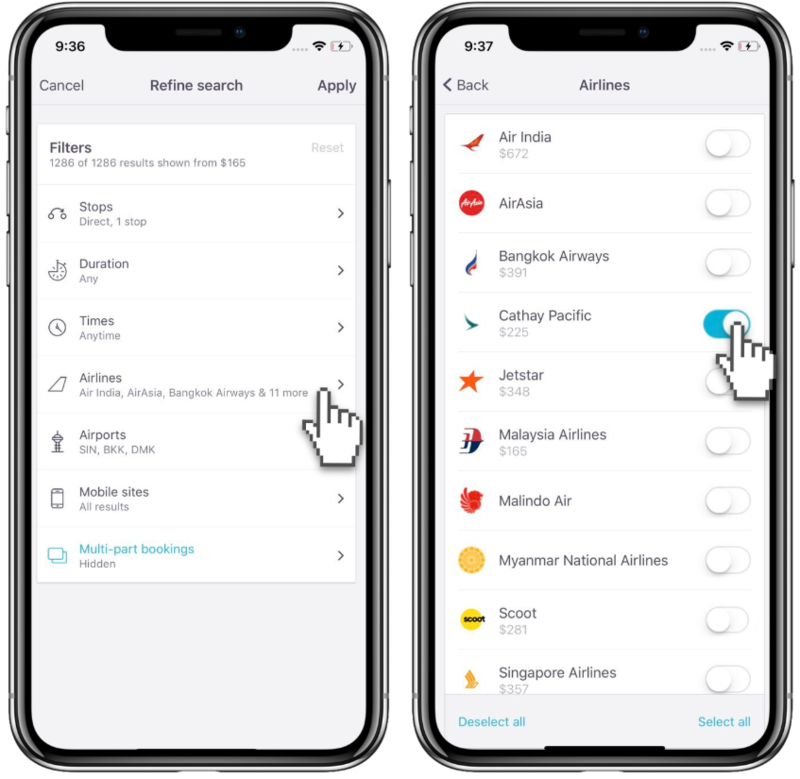 Simply use the airline filter on the Skyscanner app to find Cathay Pacific promotion flights. 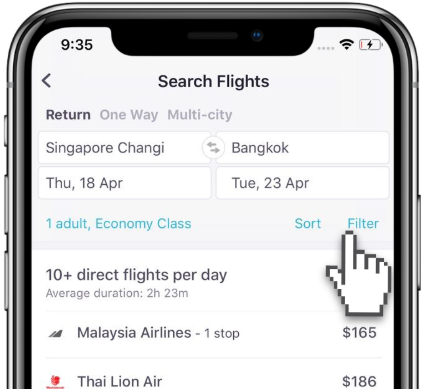 Begin by choosing your destination and dates, and then tap “Filter.” Choose Airlines, and then choose Cathay Pacific. 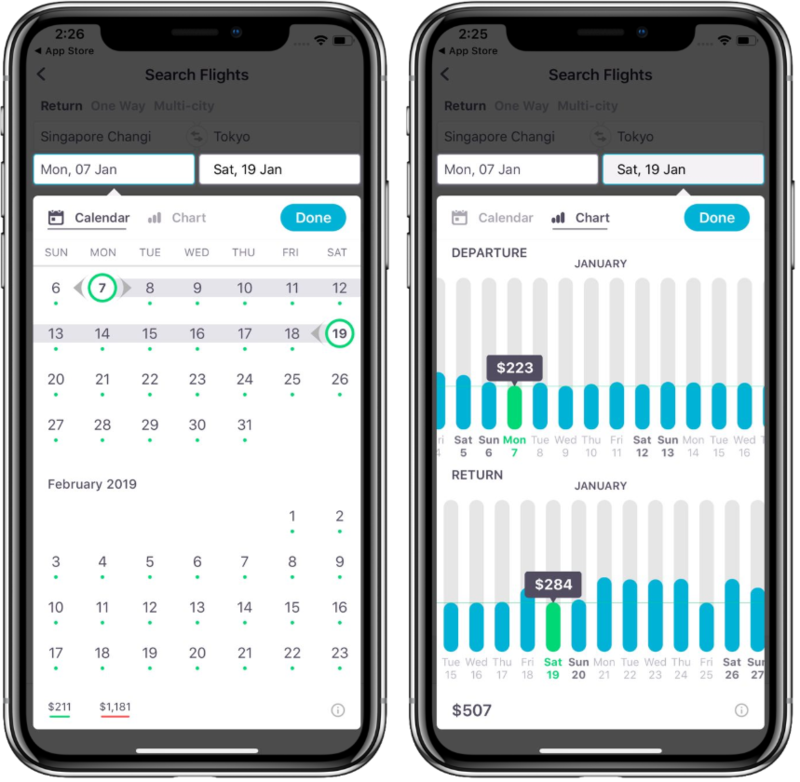 Get the most of any Cathay Pacific promotion this 2019 by using the Calendar View to quickly find which dates are the cheapest.